The Gentleman Crafter: Simon Says Guest Designer Tomorrow! Please join me tomorrow over at Simon Says Stamps blog to see my Guest Designer project and tutorial! 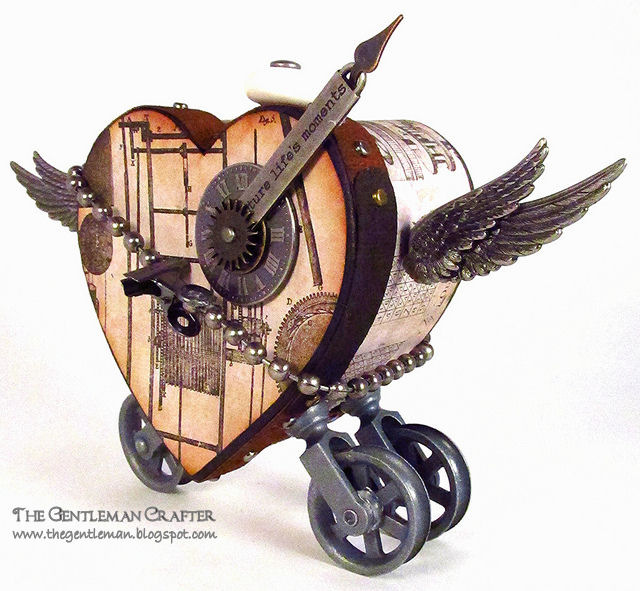 A fast and easy altered art heart with a steampunk feel. The heart box glides along on three pulley wheels. Once the Bead Chain is “unhitched”, the inside reveals a little mini book perfect for pictures and memorabilia. For more pictures and a tutorial on how to make this, please visit Simon Says Stamp's blog tomorrow morning, Wednesday, November 28th. Oh my! What a bunch of steampunky goodness! Looking forward to full details tomorrow. The whimsy of this piece is just amazing! I don't know how you manage to fit all of your fabulous ideas into one little head. I guess that's why you wear the top hat...to keep them from flying away. Seriously, Jim....you are crossing the border line from crafter to artist! I am so impressed! Oh what a fun and whimsical piece of art! I am definitely looking forward to all the details tomorrow! Jim, you are just the best! AWESOME! I love it Jim, can't wait to see the inside. Sorry to bring up your balding head, but I think I figured it out. You can't keep hair on top of your head because your mind is going 24/7 and the steam coming out of your head prevents the hair from growing. HA! Just my theory! It is always such fun visiting your blog. Steampunk is wonderful and your heart project is just beautiful. It is so imaginative. Love the "break handle" kind of piece--your imagination is over the top great. Oh what FUN!!! I love this piece!! Can't wait to see the rest of it tomorrow. You never cease to amaze me!! W O W!!!!!!! This is awesome! I wish I could just climb into your head and stay there for a bit...just to see how it works....lol....you are an amazing artist. I bow to your creativity Jim....thanks for sharing! Looks fab Jim. very creative and inspiring. Can you possibly get better, I am so impressed by everything you make. You are truly an artist! that is stinkin' adorable! love it! Oh Jim... this is ...um um ... I can't find a word ! I love it can't wait to see the "tut". Love the pulley wheels, the wings, Way cool !! You never cease to amaze me! Another winner! Oh my Jim, you have been busy. I take a few days off, and just love all the goodies you have come up with. I enjoyed the Turkey so much, I can't wait to try my hand at the Christmas tree. I actually used a MS Punch on my turkey's rosettes, and found that it was much easier to punch the strips before scoring so that I could actually score down the centers of the punch pattern which is a little more then a half inch. That meant I had to move the paper slightly each time I scored, ( a little more effort), but so worth it in the end. I will probably do the same on the tree, and definitely seperate the layers like you did. Enjoyed the video with your Mom and Ceasar. Love your Mom - she is so cute!!!!! Thanks for the sneak peek of your altered heart on wheels. So darn cute, can't wait to see tomorrows blog. This is beyond awesome!!! You are just so talented! Very cute, it has the little cogs in my brain turning. Can't wait to see the tutorial! Love Love Love this one Jim. I wonder if the mini book will be heart shaped too. Love, Love, Love this! Again another great project. Will definitely have to try this one. I have a set of those pulley's that i have been dying to use.